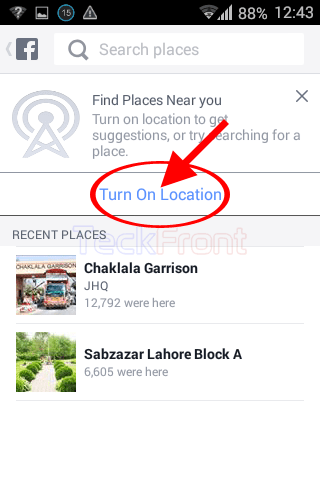 How to Turn On Location on Facebook on Android 4.4.x KitKat Device? 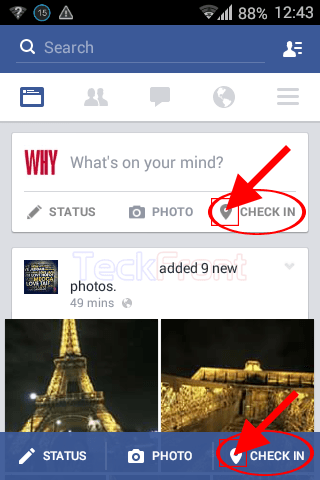 One of the most important and noticeable aspect of the photos on the Facebook (FB) is its location. Viewers at the FB are attracted most toward those images and videos which are uploaded and / or are belonged to FB friends from other locations. To make your uploaded photos on FB and to give these touch of reality, beauty and attractiveness, it is a good idea to turn on location on your profile. You may do it easily but if you feel any problem, just see the instructions. 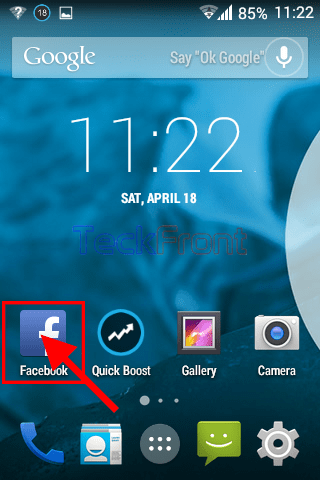 1: Tap the icon of the FB on the Home screen of your Android 4.4.x KitKat device to open up the FB app screen. 2: At the FB app screen, tap the CHECK IN, placed at 2 places; in the status bar below the wording, ‘What’s on your mind?’ and in Blue-colored status bar at the bottom of the screen. 3: Tap the ‘Turn On Location’, written in blue color, in the middle of the screen. It will open up the ‘Location’ screen. 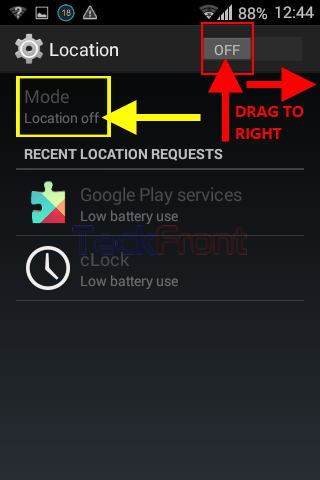 4: At the ‘Location’ screen, see the ‘Mode’ is currently ‘Location off’, pointed out by arrow of Yellow color. 5: Also see the switch of ‘Location’ is OFF, identified by the Grey color of the switch. Tap it and drag it to the right to turn it on. 6: With the change in color of the switch to Blue, the ‘Mode’ will be changed to ‘High accuracy’ indicating that the ‘Location’ is turned on. Immediately after turning on the Location, a prompt will also appear. 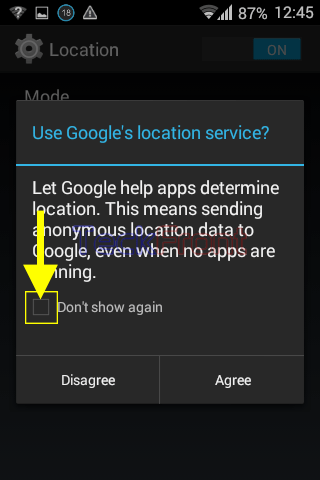 7: This prompt will inform you that the location identification will be done with the help of ‘Google’ and the location will be pointed out even if the no apps are working. If you want Android not to show this message in future, tap ‘Don’t show again’ to check it. 8: Upon checking the ‘Don’t show again’ the only active button at the bottom of the prompt to choose and enable will be ‘Agree’. 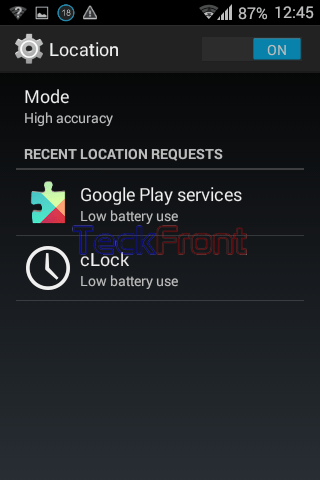 Tapping it will allow the Android to use the ‘Google’ location services to point out your location on FB. That’s all! Newer How to Check Friends Requests on Facebook on Android 4.4.x KitKat Device? 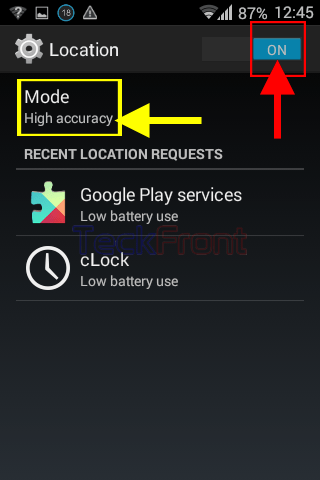 Older How to Upload Photo on Facebook on Android 4.4.x KitKat Device?